camille went through the cardboard box behind the couch and found these photos from past performances. try and guess the year by the length of her hair. 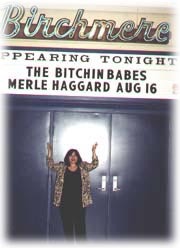 here's camille at the birchmere in alexandria, va. this was camille's first night on stage with the babes and also the night they recorded the gabby road cd. 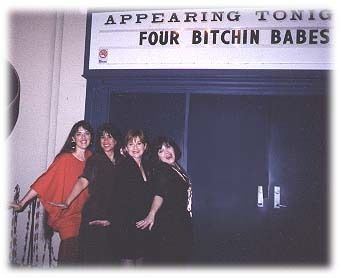 a year later, the rest of the babes joined her for a similar photo at the birchmere. this time, no merle. 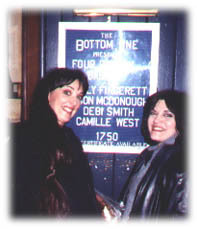 debi smith and camille admiring their names at the bottom line in new york city. 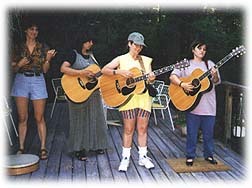 debi smith, sally fingerett, megon mcdonough and camille practicing in virginia. it looks like camille is standing on her patented "portable plywood tap dancing board." 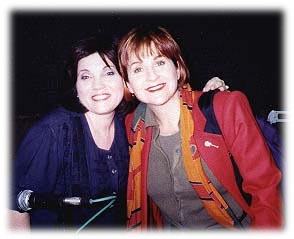 camille and megon at a radio station appearance. 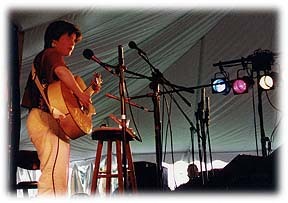 camille on stage at the golden link folk society's turtle hill festival in rochester, ny. the folks at golden link run a great organization hosting concerts in addition to the festival.